Parquet began to be laid on the floor in Russia under Peter I, during the construction of St. Petersburg. Since then, much has become different: the production of parquet, and materials for it, and equipment and methods of its installation. Parquet board has long been considered durable, beautiful and practical. The only thing that has remained unchanged during this time is the strength and beauty of the parquet floor. The parquet board is laid only on a perfectly flat surface. 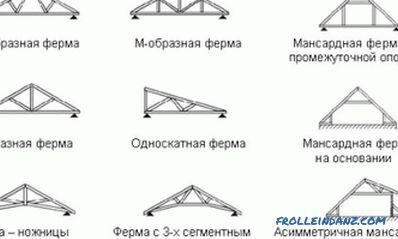 Regardless of the chosen method, several general rules must be observed when laying the floor. First, the floorboard can only be laid on a leveled roughboard. If we neglect this, then due to the remaining irregularities of the base, the interlocking joints of the floorboard will quickly become unusable. Secondly, you should never put the floorboard against the walls - be sure to leave a compensation gap of 10-15 mm between them. A parquet board, like any physical body, has the ability to expand and contract under the influence of external influences. If there is no compensation gap, then the laid board will not have room to expand, which will result in broken joints, floor warping and the need for urgent and costly repairs. Thirdly, the aesthetic beauty of the floor is largely determined not only by the quality of the installation, but also by the direction of the laid panels. 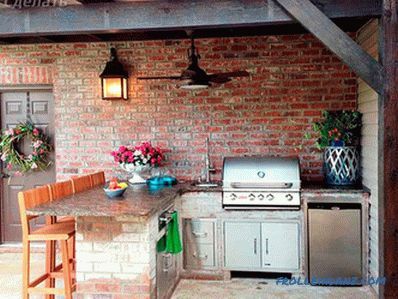 Here, for most methods, traditional patterns are also possible — along or across the room, and more spectacular and spectacular — laying diagonally. But, choosing the last drawing, you need to consider that it will be more expensive in terms of material consumption and more labor-intensive in execution. In addition, when laying the floorboard on the logs, it is almost impossible to implement it purely constructively. If you still decide, then you will need to expose the logs in a special way and spend much more time to create a flat horizontal line of lag than the actual installation of the floor. Laying a parquet in a floating way. Floors in private houses or apartments today are increasingly made floating. 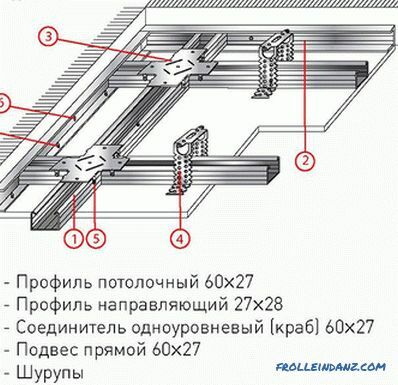 The peculiarity of this method is that all surface elements are interconnected by means of a spike-groove connection system into a single web, which remains unattached to the base of the subfloor. 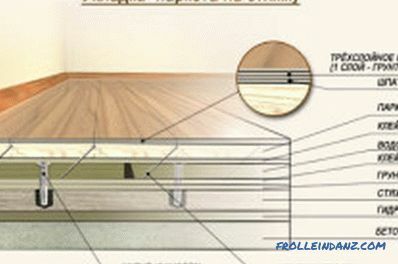 This method was first developed for laying a laminate floor, but due to the similarity of the structures of the connection of the laminate and the floorboard is perfect for the latter. This option has several advantages. The most important of them is the simplicity of laying the floor, which allows even people who have never done such work before. In addition, this method is one of the fastest in execution, which allows you to significantly save time. And given that the finishing floor is not attached to the base, there is no need for additional fastening materials and mechanisms. When repairing such a floor, you can easily replace several damaged boards without completely disassembling the surface. This method has a disadvantage. It can be used for small and medium-sized rooms. And in large ones, it can cause the surface to warp, since the movements of a large area of ​​the floorboard due to changes in the temperature and humidity conditions will be quite noticeable. 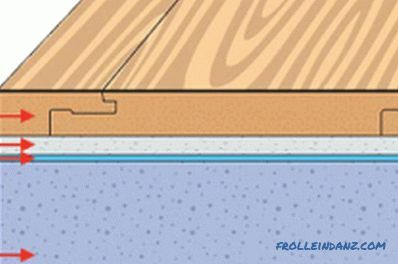 The glueing method of laying is used in cases when it is necessary to ensure rigid adhesion of the floorboard and the base of the floor. It is usually used when the floor is arranged in a large room. 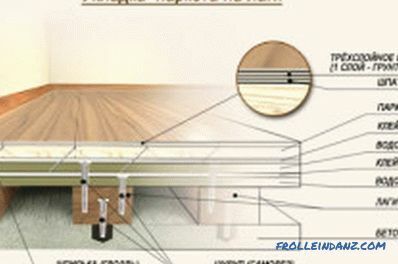 This method requires the most even, without visible defects, the surface of the subfloor. It can be provided only by arranging a rough floor made of plywood sheets or chipboard, and these are additional financial and time costs. Today, the option of landing on glue is used infrequently, since in addition to the additional cost of materials, it takes a lot of time and attention from the performer. When using wood flooring as a draft flooring, flooring must be laid on both the old and the new floor. These laying options vary in the way they prepare a rough base. Old wooden floor must first be repaired, having touched the floorboards and eliminated the grooves, chips and gaps between them, as well as strengthening or replacing the creaking floorboards. To level old wooden surfaces is extremely difficult.Therefore, to align, you need to acquire a grinding machine - without it, it will be impossible to perform the work of high quality. When leveling a new wooden floor, there will be fewer problems: there is no need to sort out the floorboards, and you can even out the projecting ends of the floorboards with a plane if you have at least minimal skills to work with it. Laying on a concrete base remains today the most popular when constructing the floor in urban high-rises, since they use concrete slabs as the floor slab. Here, unlike the wooden floor, you first need to make a concrete base screed, and then either put sheets of plywood or particleboard on it and attach the floorboard to them, or, putting a layer of waterproofing and insulation, install the floorboard in a floating way directly onto the screed . In addition to these basic methods, in construction practice there are cases when you have to install a floorboard on a base of linoleum or carpet. There are no contraindications for such laying, in this case the draft coating will simultaneously fulfill the role of insulation. But it is possible to carry out laying on such basis only in the floating way. 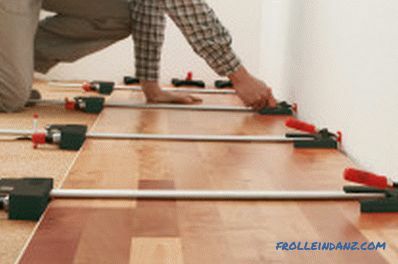 This method began laying parquet, but despite such a respectable age, it is still one of the most popular options today. Its essence lies in the fact that the floorboard is rigidly fixed to the exposed wooden logs with nails or screws on the tree. They fix the board to the logs, passing nails or screws through its fastening locks. 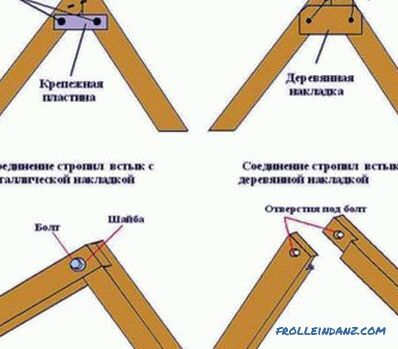 The difficulty of this method is not that it is difficult to mount the floor surface, but to set the lags with a jeweler's precision into a single flat horizontal surface. 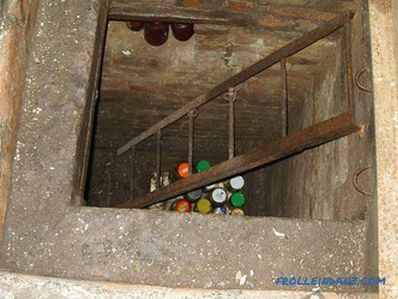 This complex construction operation is the main component of a high-quality and even floor. With such a wealth of options for laying floorboard, it is impossible to determine which one is better and which is worse. This can only be determined in each specific case based on the size of the room, the material and the condition of the subfloor, its own abilities and preferences. Good luck!